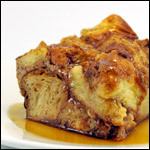 Check out our article about toppings for French toast besides maple syrup. 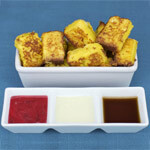 This is a great basic French toast recipe submitted to our message board by a fantastic breakfast lover named HELLINOIS. 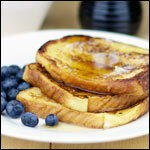 What do you think of Basic French Toast? View all 70 comments for this recipe. Try this without the sugar, a touch less salt and eat with Mr Heinz's ketchup on the side for a savory treat. Just tried it and it was great. Add a teaspoon of vanilla and 1/4 teaspoon cinnamon and this is how I've made it for decades. 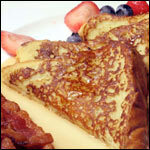 Get day-old bread on Friday for the best French toast on Sunday. Made it for Christmas breakfast and everyone loved it. Thanks guys! I love this. It came out great. We made this and then used the blueberry compote from your Red, White and Blueberry Pancake recipe for the topping. It was a match made in heaven! Thanks Mr. B! So yummy! If you haven't tried this yet, you should! I make french toast all the time myself except with wheat bread and a little bit of powdered cinnamon, nutmeg, brown sugar all mixed in the bowel along with the basic milk and egg(s). I added cinnamon sprinkles and vanilla in the egg mixture... DELICIOUS!! Great way to start your day! Was great with just cinnamon sprinkled on top! Very good. For the bread, you really don't need to use white bread - wheat bread works great. Thank you. This was an excellent dish to make for my French assignment and so easy to make. I'm also eleven and made them. Everyone loved them and for a bit more flavor I added vanilla extract. Thanks! This was super tasty topped with sliced bananas and warm maple syrup. 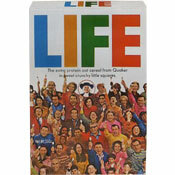 Everybody liked it. Thanks.